新年快乐! 恭喜发财! Happy Chinese New Year!! Happiness and Prosperity! Although it technically starts tomorrow, the new year of the Chinese calendar - The Year of the Horse - has already begun in the far East! The Horse year is apparently a good one. 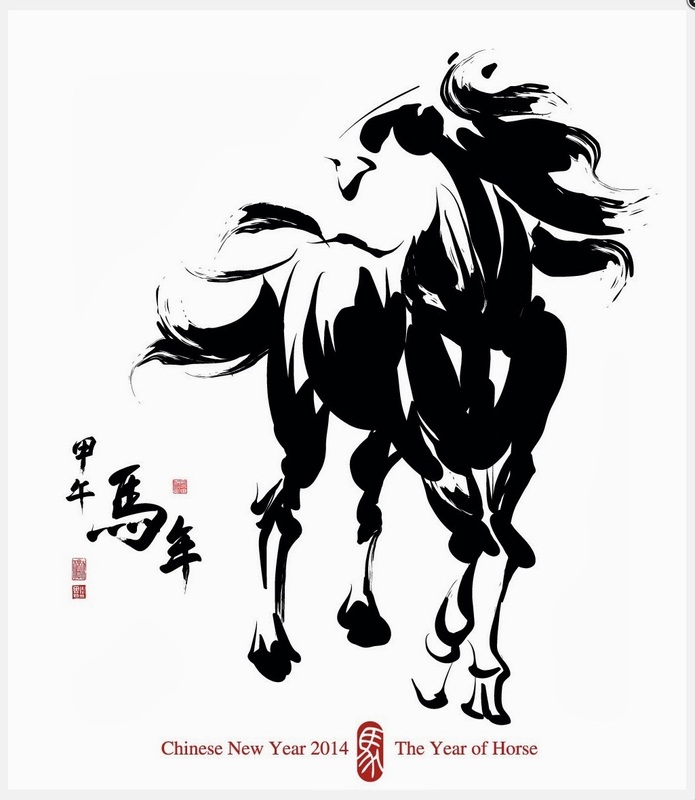 If you are born in the year of the horse there are strengths and weaknesses. They can be clever and kind to others but also impatient, hot-blooded and rarely listen to advice. Sounds a little bit like a horse! 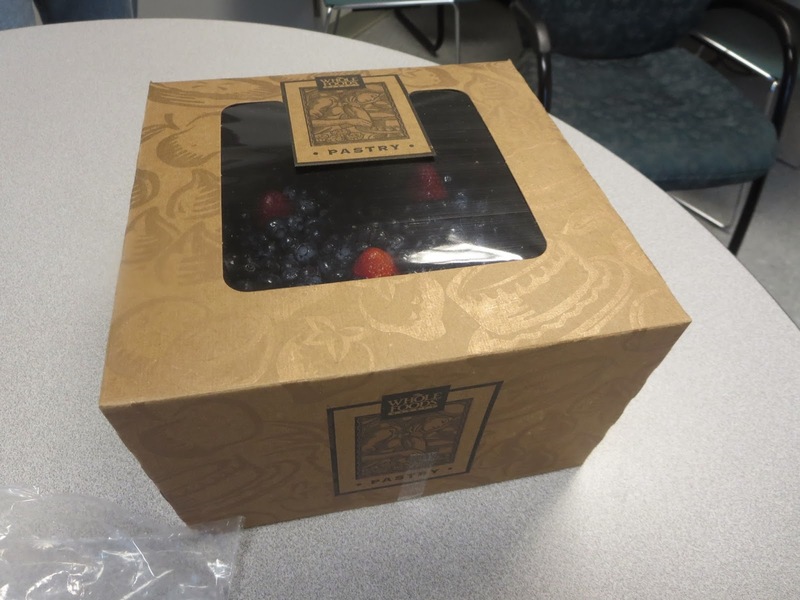 To celebrate the New Year one of our Chinese colleagues brought in a treat from the Vienna Bakery. 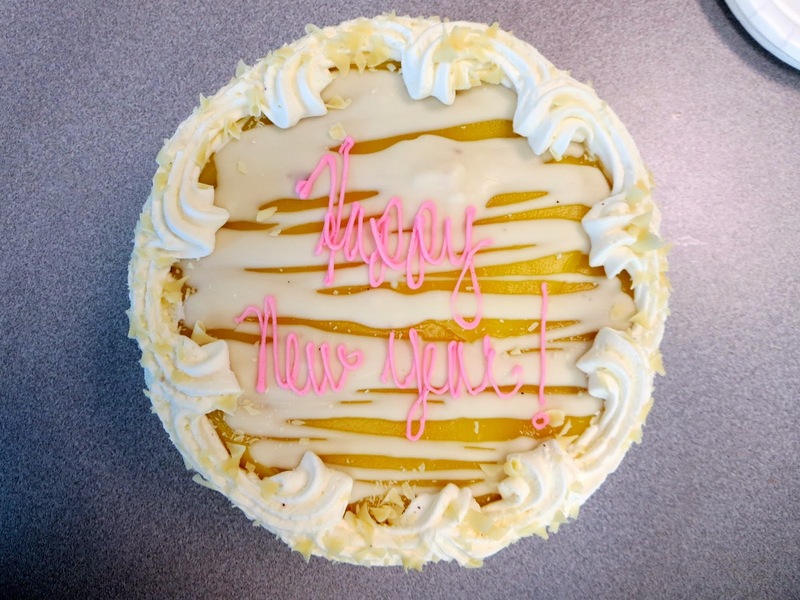 This was a very nice looking cake with a Happy New Year greeting on the top. She wanted it to read "Happy Chinese New Year" but was told there would not be enough room. Couldn't fit the word Chinese in! A lemon cream cake - something different! Helping us all celebrate Chinese New Year! 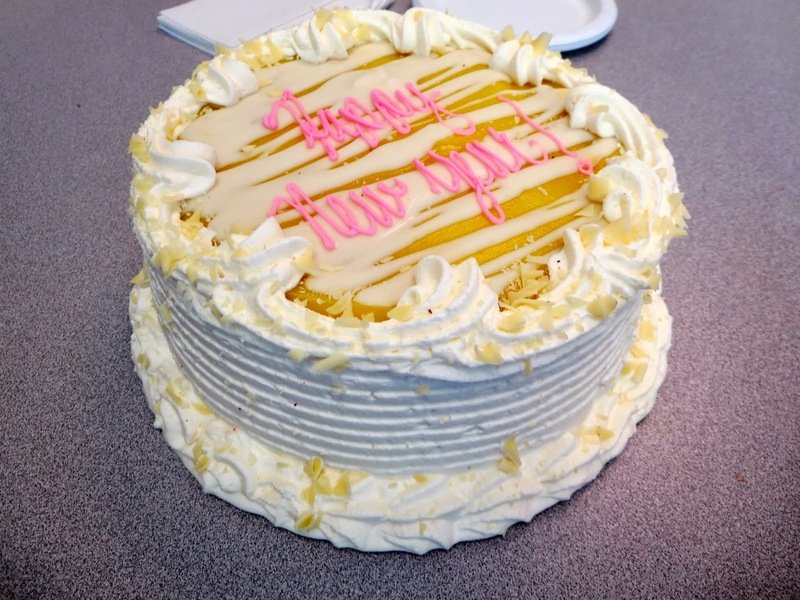 This was a white chocolate lemon cake with a whipped cream frosting. The Vienna always does a nice job and although we have had many of their creations we had not seen this before. 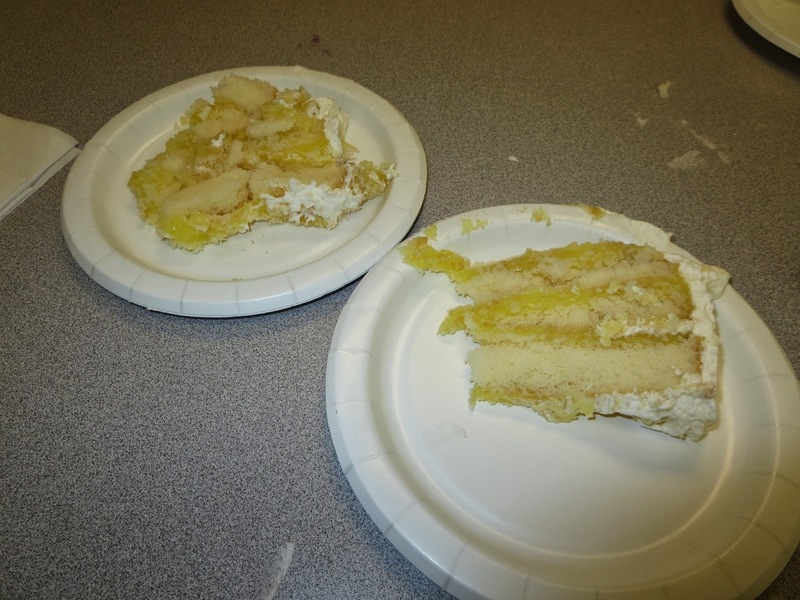 It was a four layer white cake with lemon icing in between - a little like your get with lemon meringue pie. 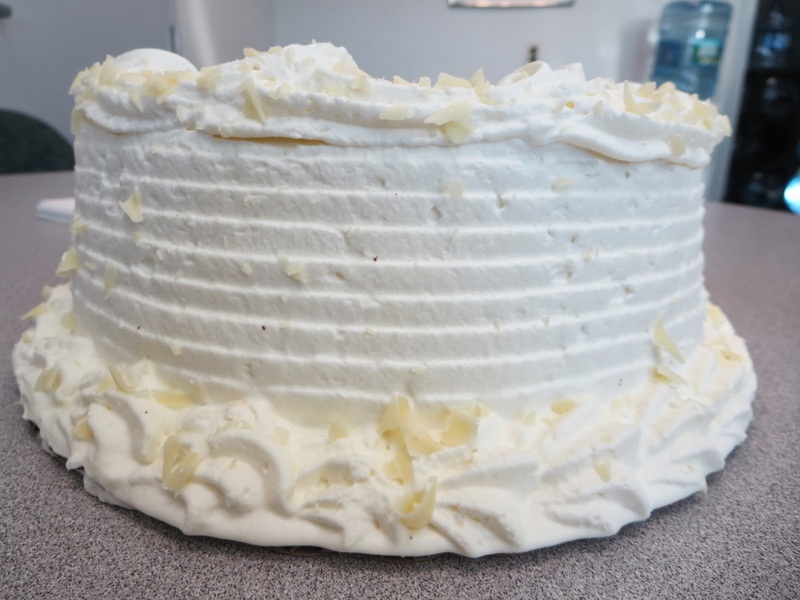 The side was frosted with a light whipped cream and on top there was a layer of lemon icing with rafts of white chocolate. Always a favorite - whipped cream frosting! 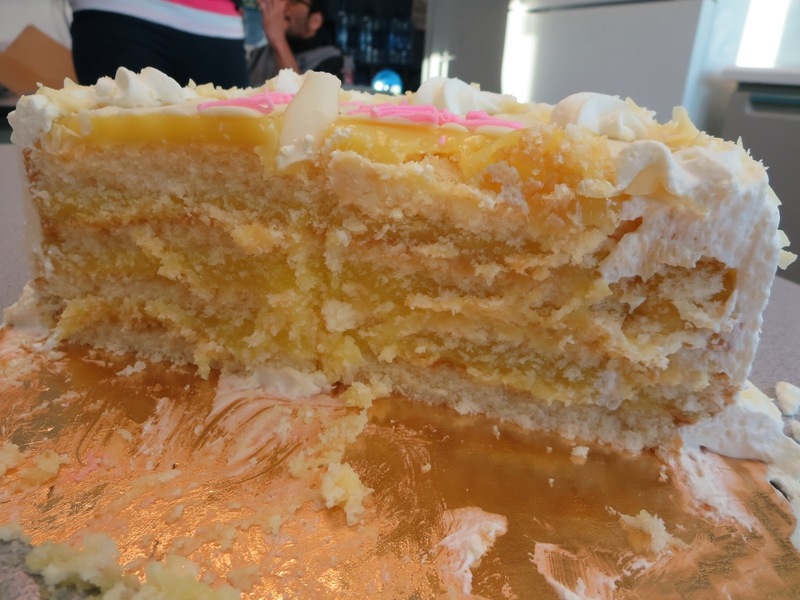 Multiple layers with lemon icing in between! This was a nice combo and proved to be very popular. 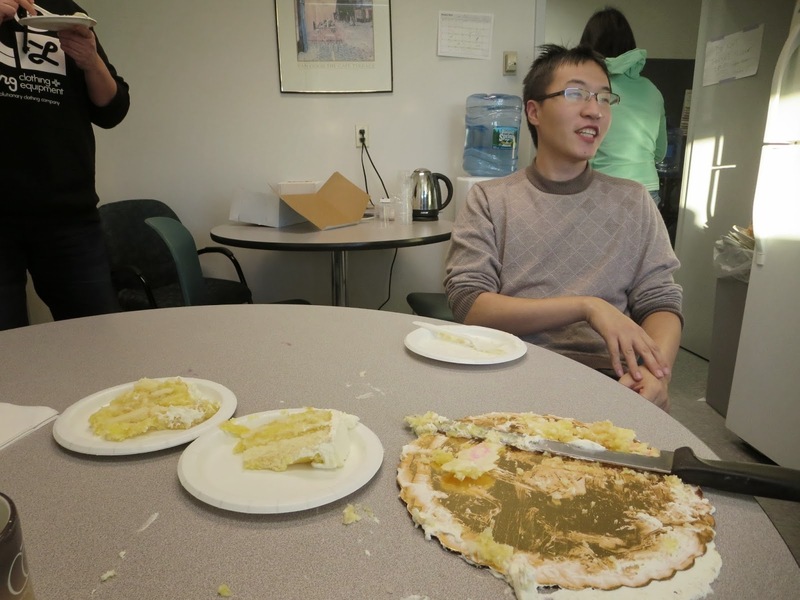 The cake was fresh and because of the lemon those who are not into sweet cakes were very happy. There is usually a little something left over but as you can see this cake didn't last. 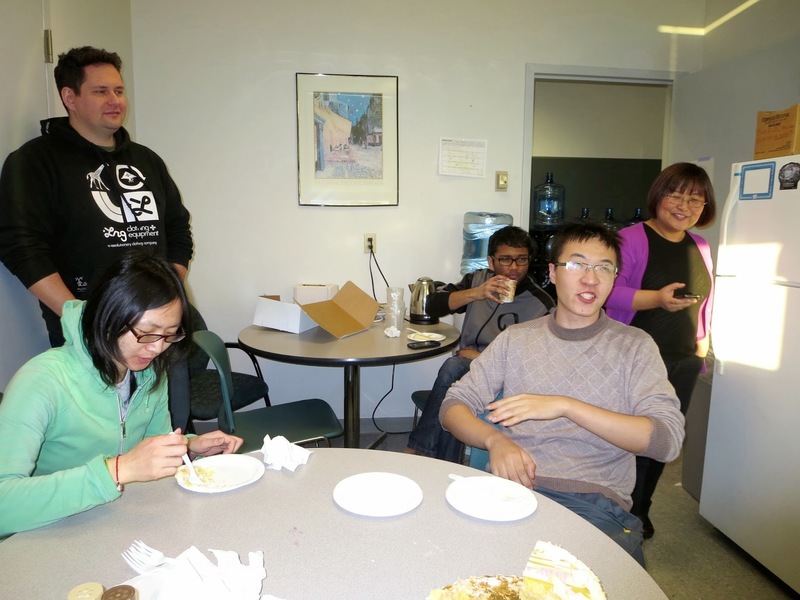 This was partly because a lot of our Chinese colleagues joined in. Down to the last two pieces! We made short work of that! We learned a little about what to say. We have heard the expression 恭喜发财 or Gōngxǐ fācái quite a bit. However this is apparently a Cantonese expression that is used, ostensibly originating in the business community, to wish for a prosperous new year. The regular Mandarin greeting is 新年快乐 or Xīnnián kuàilè which tranlsates to New Year's happiness! Happy New Year! I got the last piece! We also learned about some of the traits that going along with being born in a particular animal year. Sheep are gentle, monkeys are quick witted, roosters are loyal and pigs are gallant - so too shall the people be that are born in those particular years. Now you understand why the animal/year associations are often referred to as the Chinese zodiac. In the West it is monthly, in the East yearly! "a monkey born from a stone who acquires supernatural powers through Taoist practices. After rebelling against heaven and being imprisoned under a mountain by the Buddha, he later accompanies the monk Xuanzang on a journey to retrieve Buddhist sutras from India." 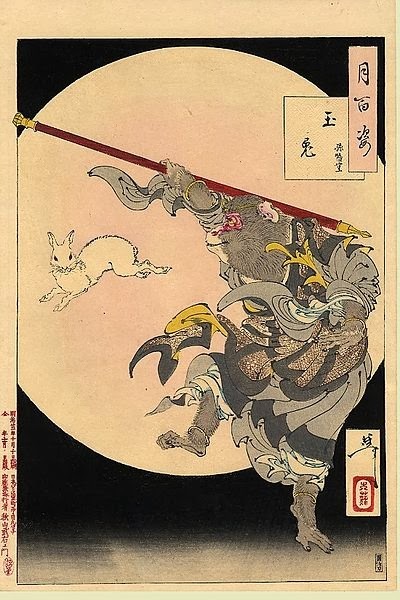 Check out he Wiki page http://en.wikipedia.org/wiki/Sun_Wukong for more info about "One of the most enduring Chinese literary characters, Sun Wukong has a varied background and colorful cultural history."!! Telling us all the story of the monkey king! And this is the monkey king! There was another story about a character who is a handsome man in heaven but a pig when he is down on earth. Hmm, that could be any football fan preparing for this weekend's Super Bowl. The character, who cavorted with the Monkey King is Zhu Bajie. He also can be found on Wikipedia. 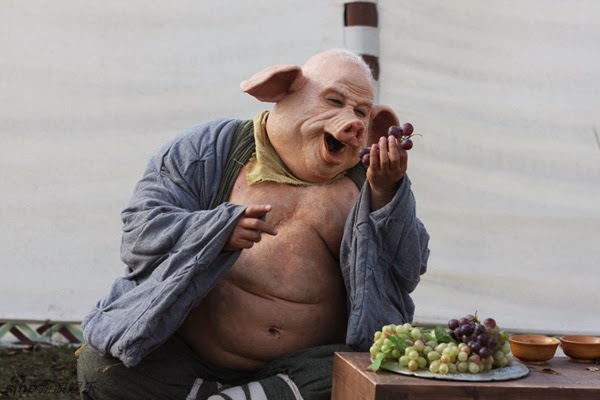 This guy got in trouble for sexually harassing the Goddess of the Moon and in any case, he was exiled from Heaven and sent to be reincarnated on Earth, where by mishap he fell into a pig well and ended up being reborn as a man-eating pig-monster! Early Chinese literature was quite imaginative!! And that's the end of the story! Buy up all the cookies when you forget your cake! 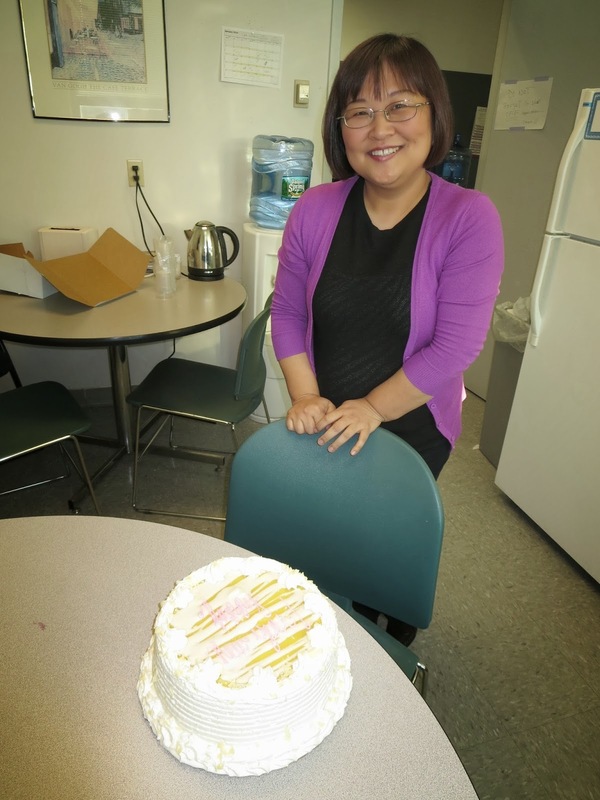 Our designee for today suddenly realized that she had signed up for cake hour but forgot to pick something up. With limited circumstances for buying anything in the area, she took a chance. She went to the local deli known for their sandwiches and sought to get anything they could offer. They do have individual cookies for sale which was a relief and she promptly bought up the store. Mind you this place does not usually have a pile of cookies on display but rather one or two. So it may well be that she bought out the whole supply for a week since she walked away with quite a few! After getting them here she arranged them in a nice display and cake hour was off. She also tossed in a few muffins for variety. She got something here and displayed it nicely! 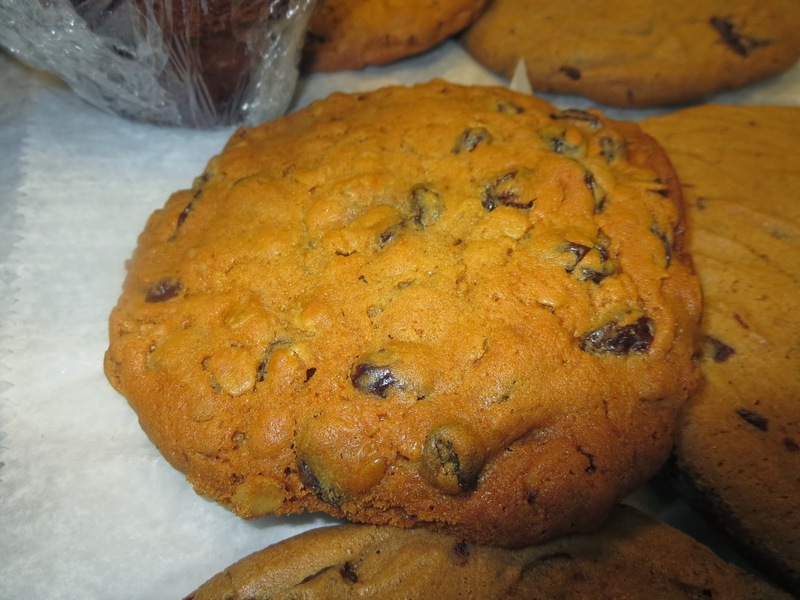 These are large commercial cookies with good size chunks of chocolate, not necessarily chips. 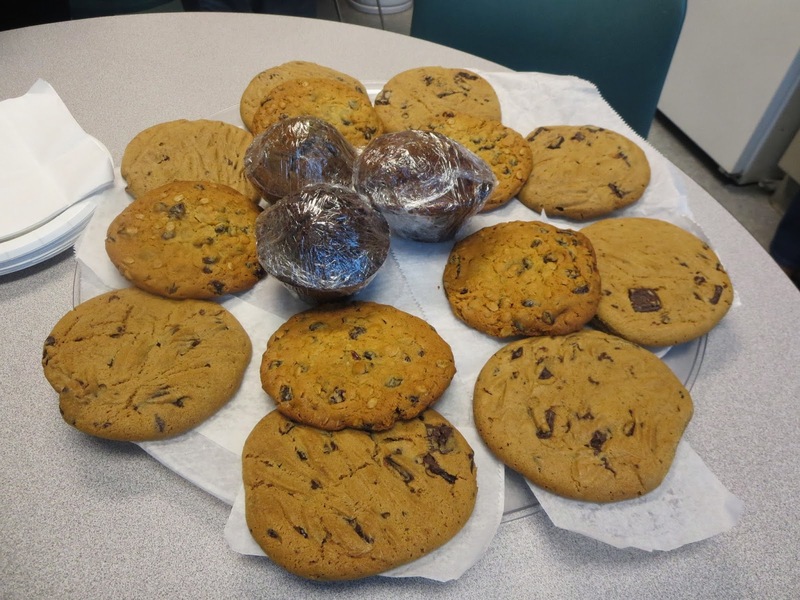 There were also some oatmeal raisin or dried grape cookies as they were referred to by one of our English learning colleagues. He now knows what a raisin in. 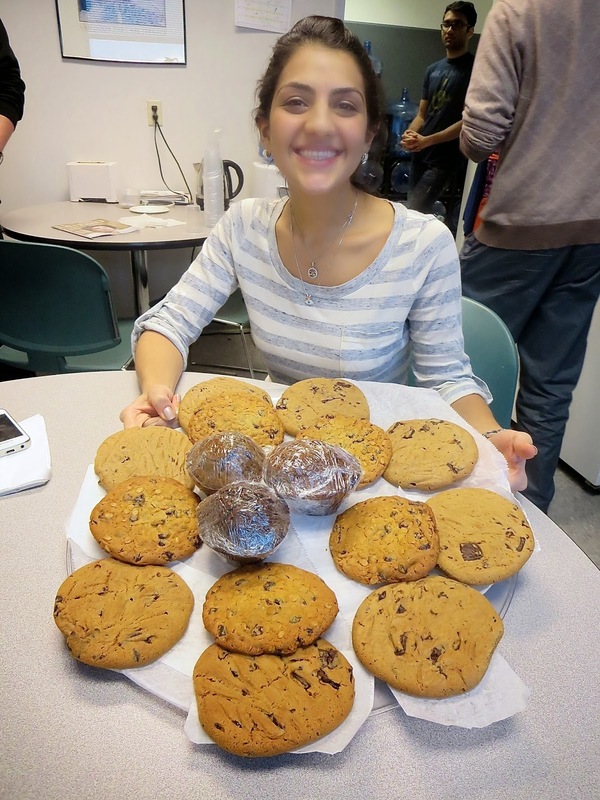 The cookies were good and hit the spot. 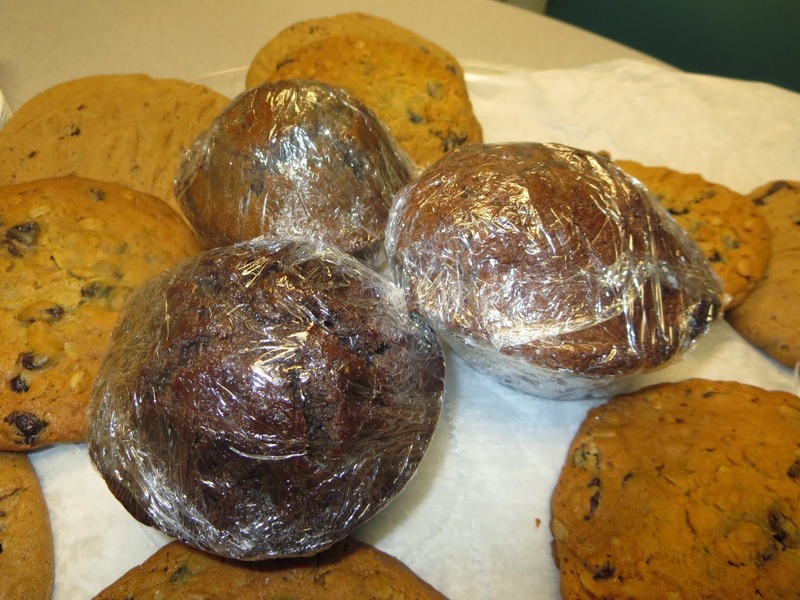 The muffins were spice type and bran muffins. No complaints and we were happy that our colleague met her obligations and got something here. Otherwise we might have had to ship her back to Brazil! 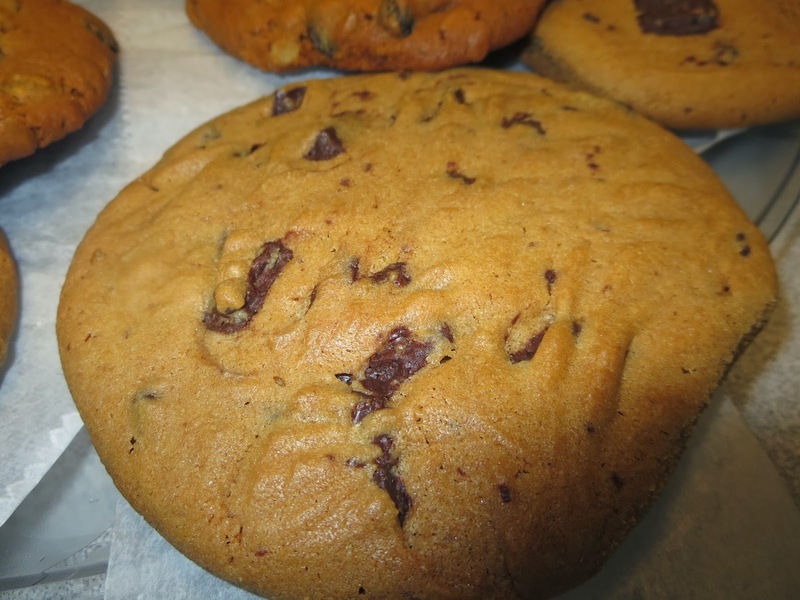 Good size chocolate chunk cookies! And some with dried grapes! And a few muffins for variety! 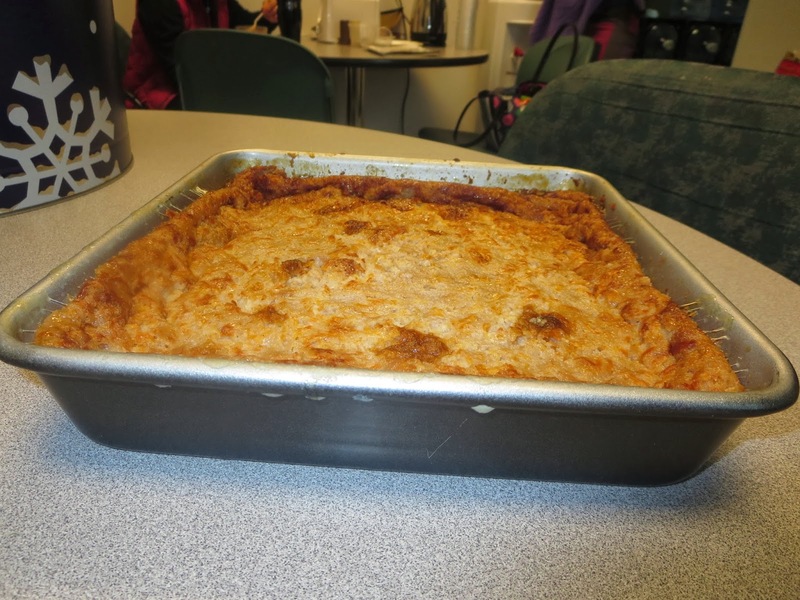 Our bringer of cake for today hails from the Middle Eastern. In the past we have seen specialties from that area including some very good baklava goodies. 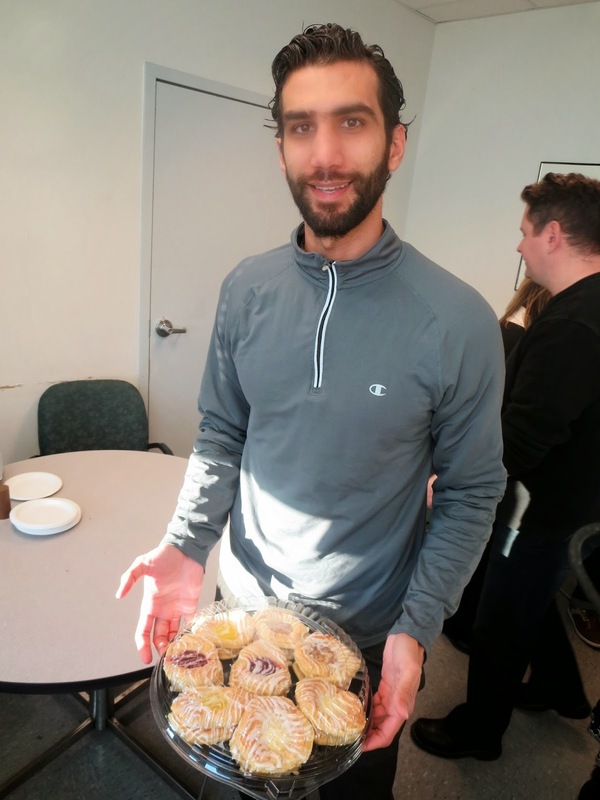 So imagine our surprise when he shows up with a tray of Danish pastries - the American kind. 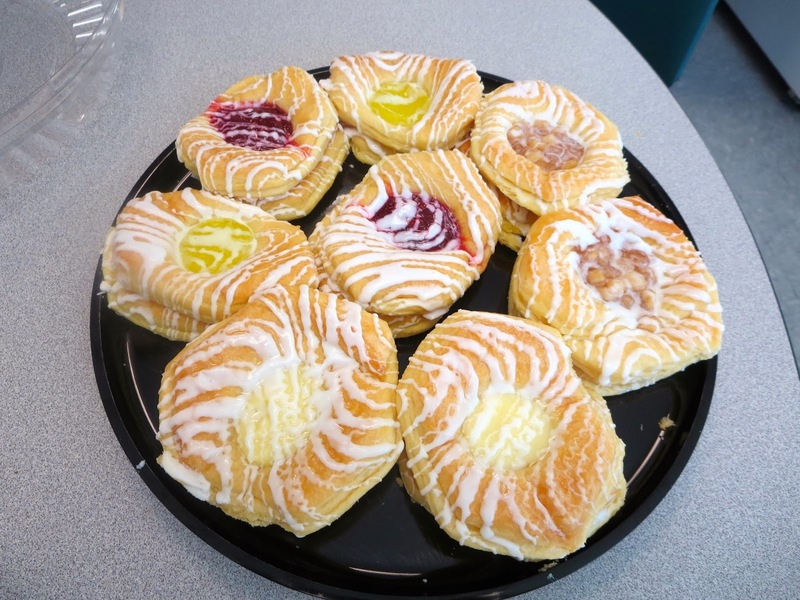 This was actually a first in that we could not remember a time that we ever had Danish pastries at cake hour. 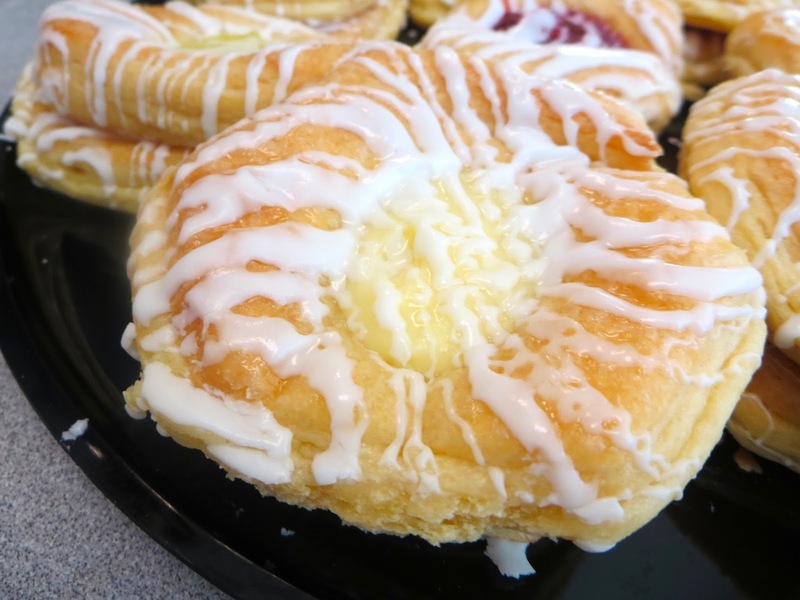 Did you know Danish pastry, actually, originated in Vienna. And in Denmark it is referred to as Vienna Bread. For some reason the Danes had to import some bakers form Austria who started baking what they knew and ended up creating a new type of treat. 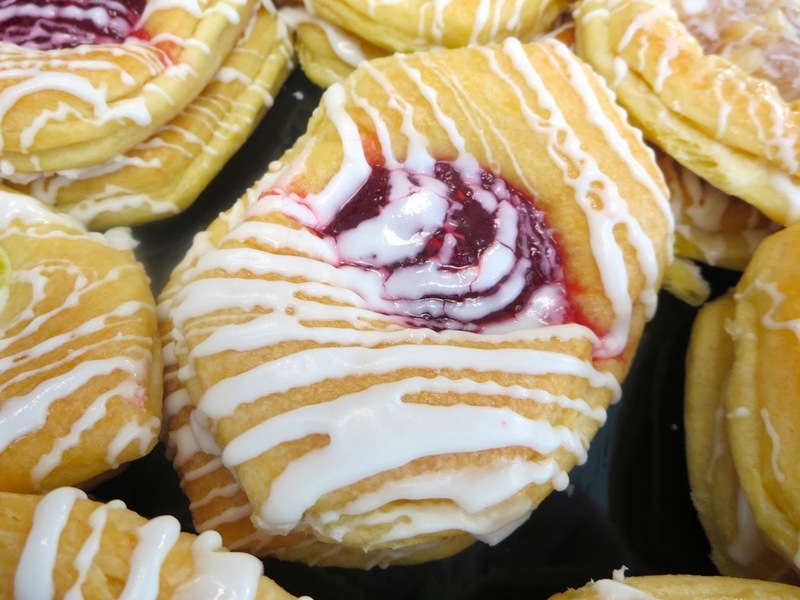 Danish pastries are now all over the world. So let's give them a try! 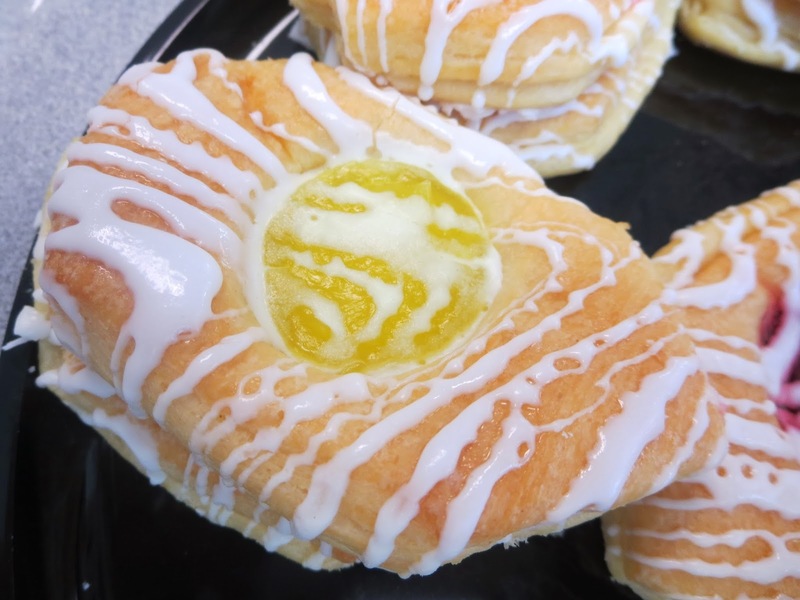 Lemon Danish..not seen too often! 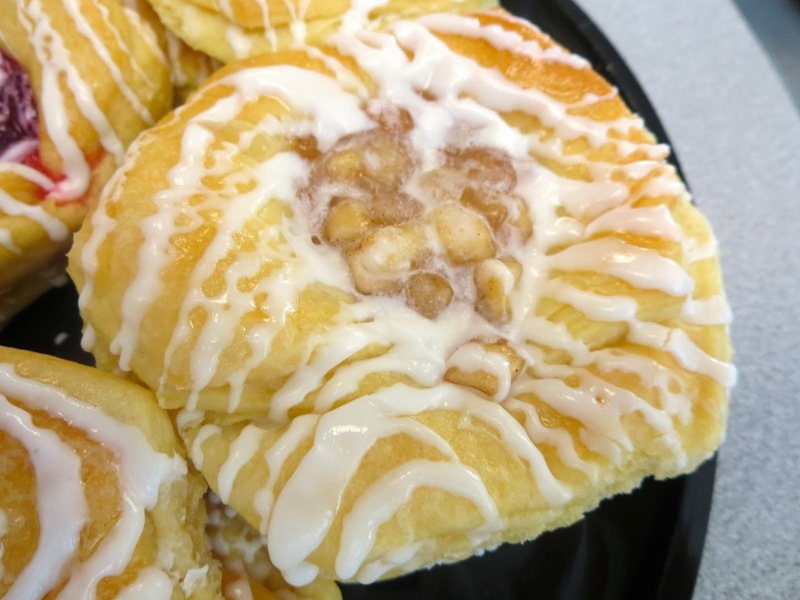 Today's premier Danish were brought in a tray that contained four different kinds - cheese danish, raspberry danish, lemon danish and apple cinnamon danish. Although they look pretty thick on the tray in fact they are stacked two high so each pastry is not as caloric as it at first looks. Everything was as expected. There was the very moist pastry portion, the central filling and then the powdered sugar syrup icing drizzled across the top. Classic! Inasmuch that some danish pastries can be very dry and doughy these were a pleasant surprise. 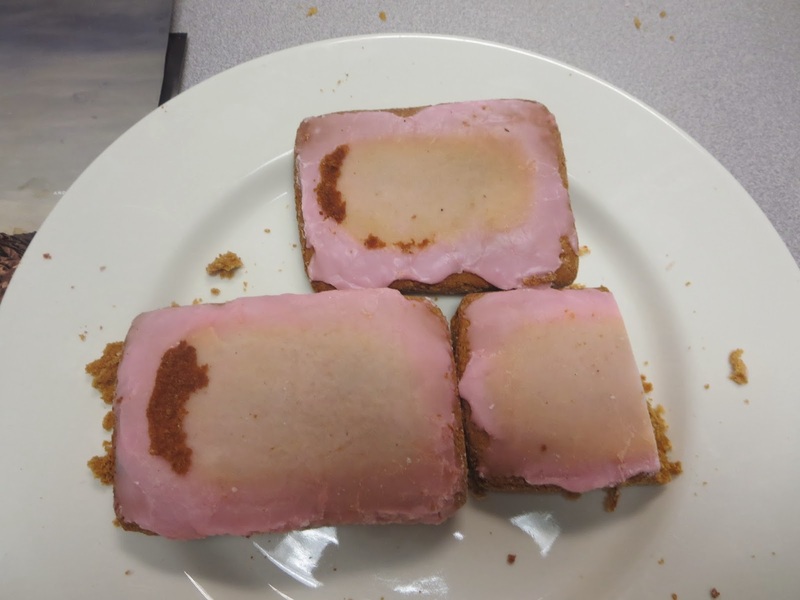 The fillings were pretty commercial but it was expected. The apple seemed to be the most popular but the others were also tasty which is not bad considering this is a very commercial product. We don't suspect a local baker got up at 4am to make the dough and bake these. Nevertheless we appreciated them. Thanks to our Lebanese friend for the Viennese inspired Danish treat. And apple! This one was the big hit! 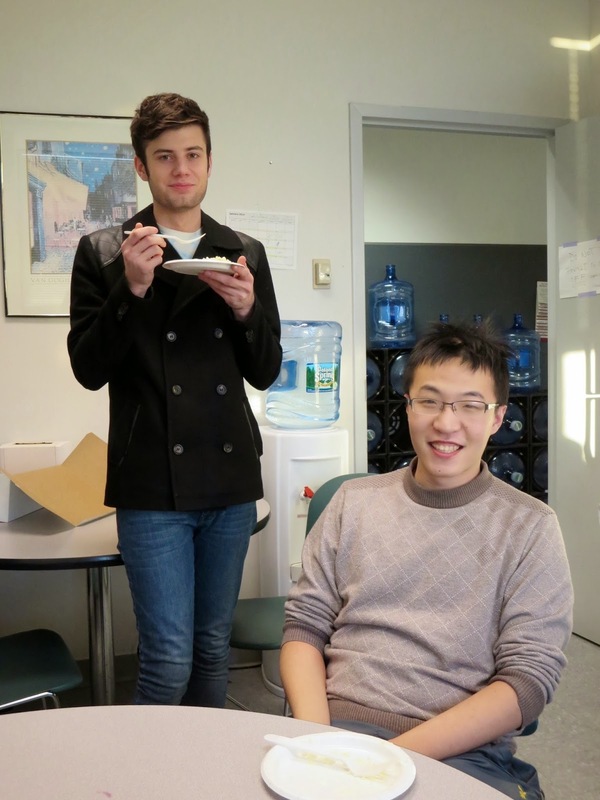 Today the students returned from their really long semester break. Five weeks! Do they think they are in Europe or something. 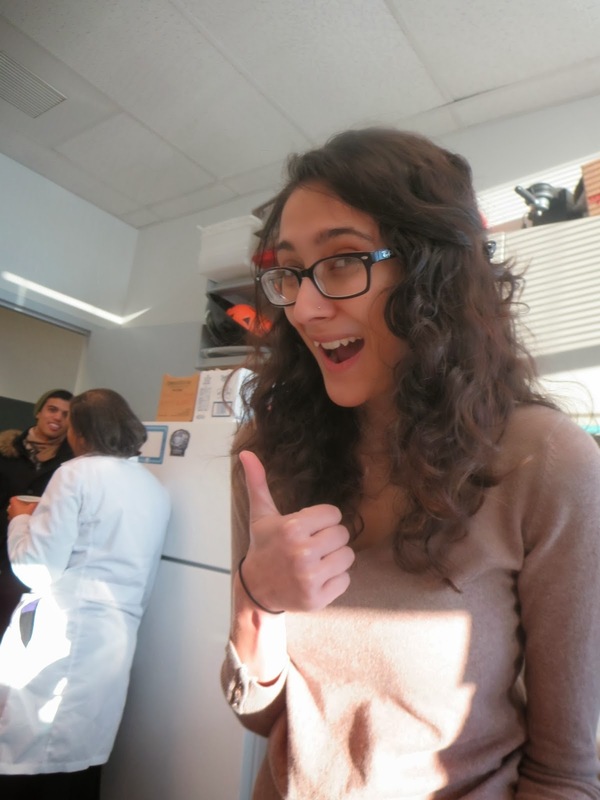 Needless to say a few faces returned to the lab and cake hour. 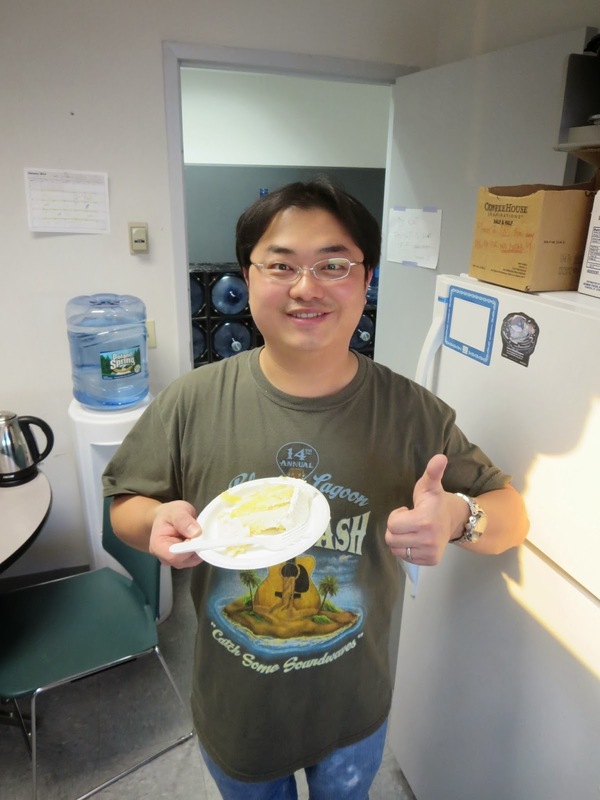 Thumbs up for cake, again! 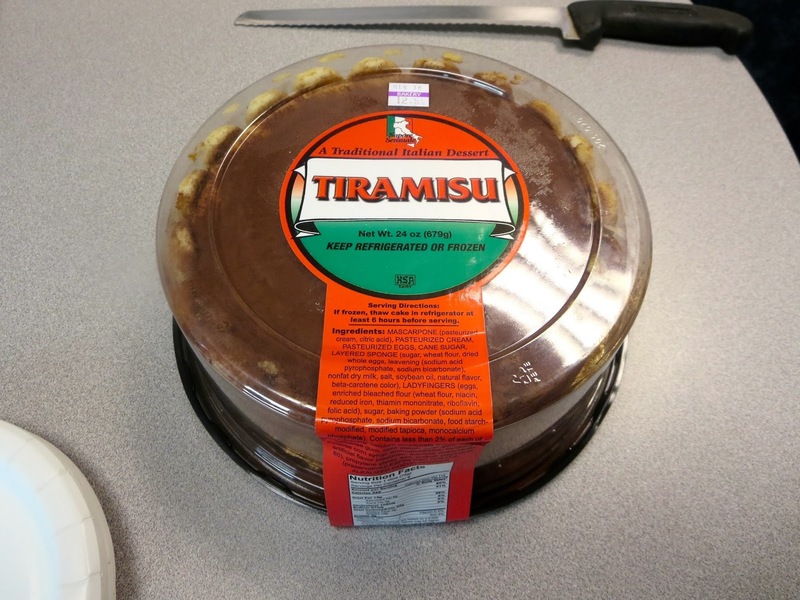 That would be a tiramisu! 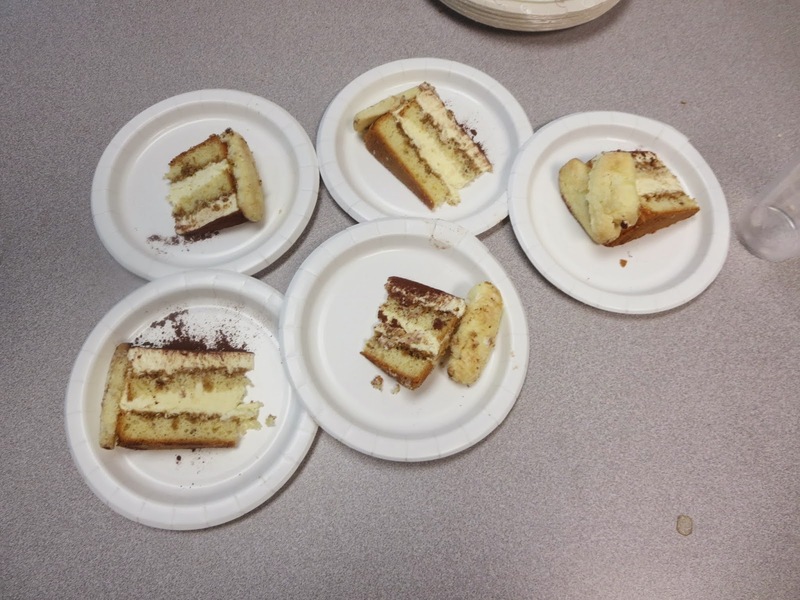 Ever since our Italian grad student bade us farewell having become a PhD, we've had a dry spell for sure. No one appears to have gotten her recipe so we can't make what she did. We know she handed the recipe out so perhaps someone is being coy and doesn't want to have to make it for us. That would be cruel! It's always brave to bring one of these..with out history! 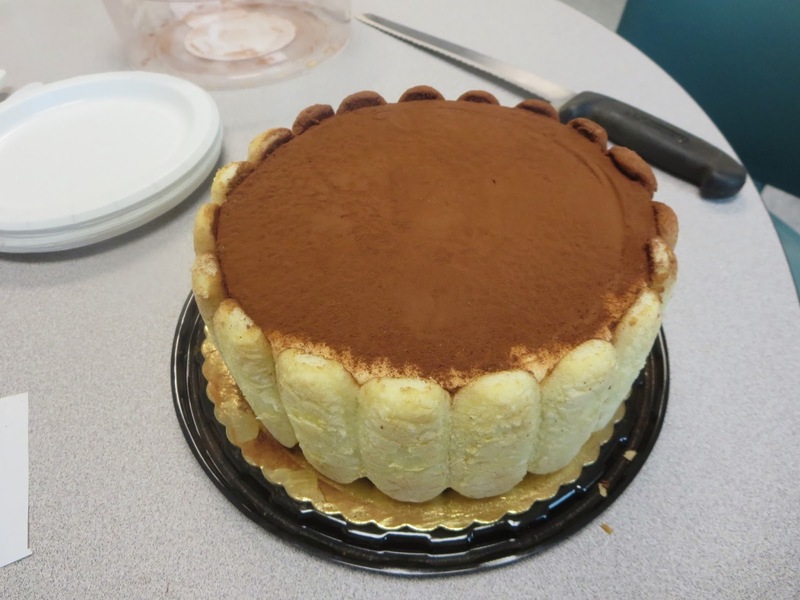 Today's cake, brought to us via a supermarket in Marlborough, MA was a Tiramisu cake. It was circular and had a classic look to it. 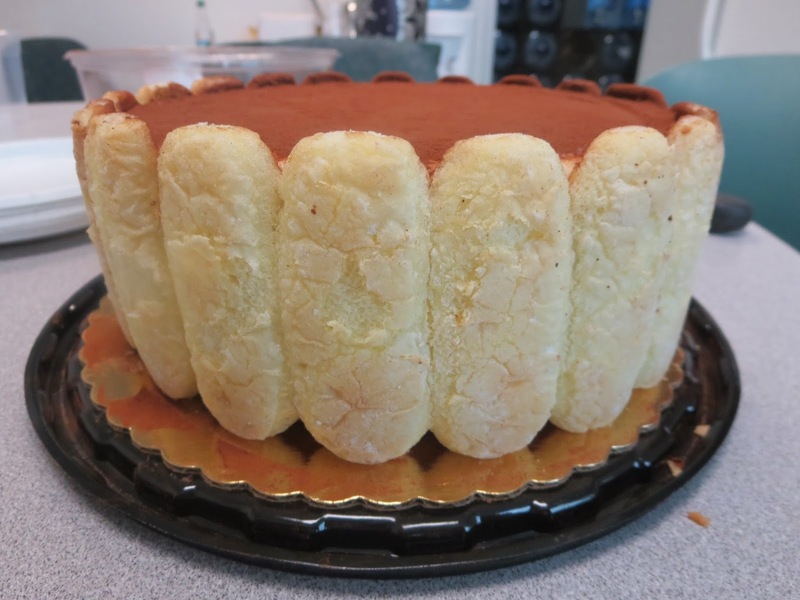 There was a ring of the obligatory lady fingers around the outside, two layers of cake and then the mascarpone filling was between the layers and on the top. 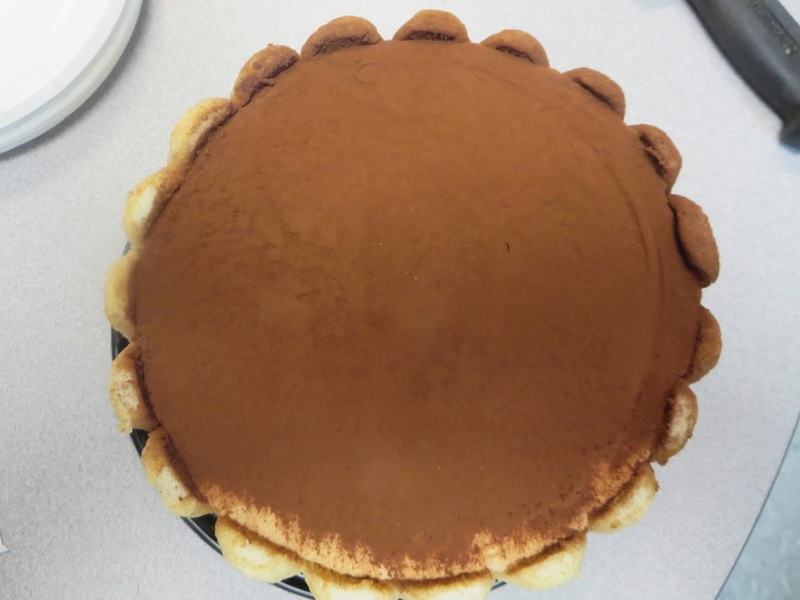 It was finished on the top with a layer of the also obligatory cocoa powder. This having been sold in a supermarket we tend to suspect there was no amaretto or other spirit in it which is too bad as it does give it a bit more flair. This cocoa powder can give you asthma! Despite the fact that we are spoiled when it comes to this dish, this was perfectly acceptable. 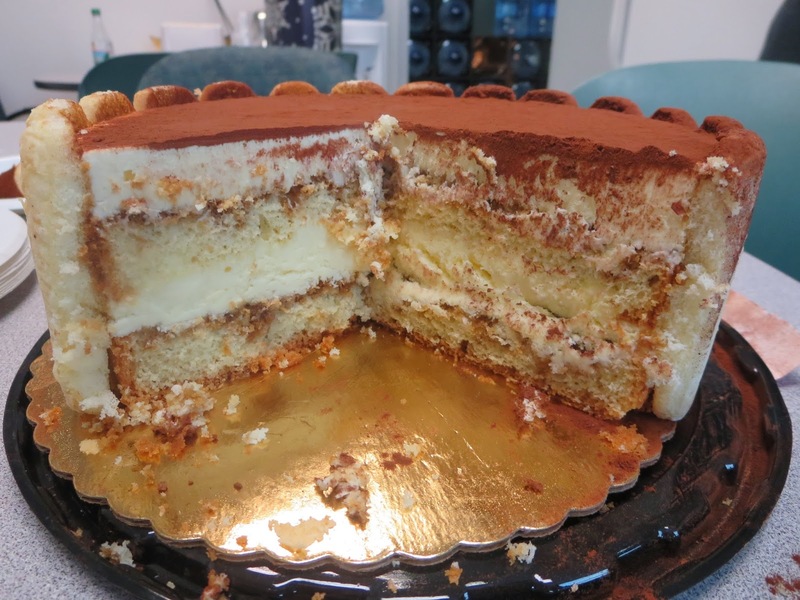 It had good moist cake with adequately sweetened mascarpone. It was on the light side which is always preferable and as such was not too filling. Good choice, Marlborough lady! Pretty soon it came to this! We are finally getting to the end of the popcorn! The caramel seems to have gone first. 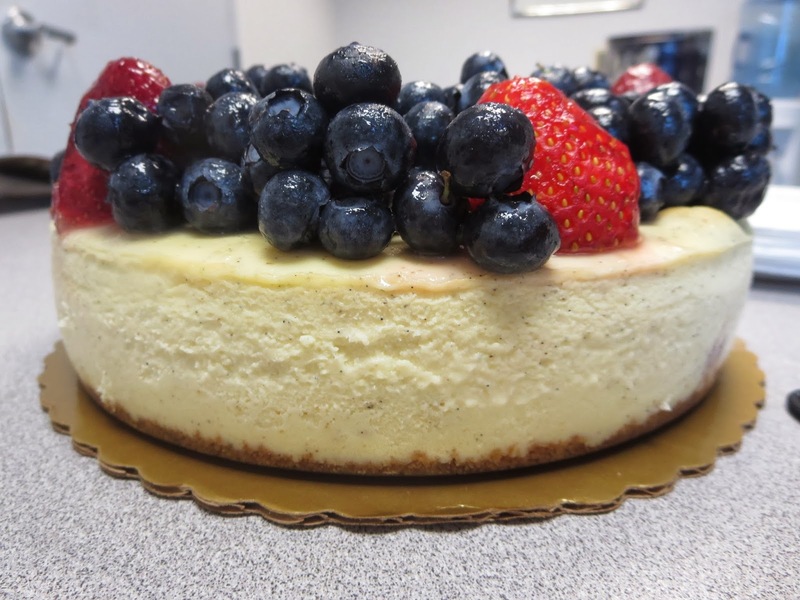 First Cheesecake of the Year! A cake hour newbie has his first cake hour obligation. He opted for a cheesecake. The first one of 2014! We actually haven't had one in awhile. We used to get Cheesecake Factory gift cards as part of a rewards program and pretty much tried everything that they had to offer. 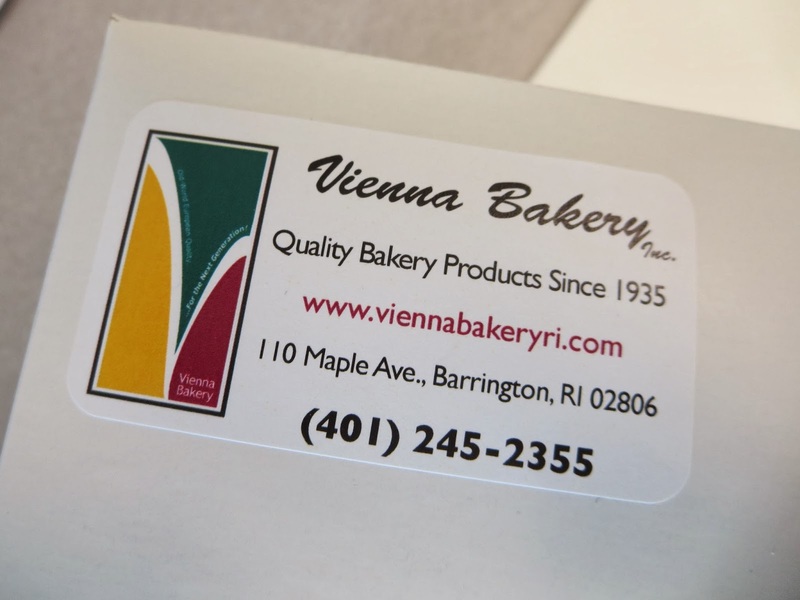 The rewards program branched off and now we can get cards from about any bakery so we are mixing it up a bit. Today's entry had nothing to do with a gift card. 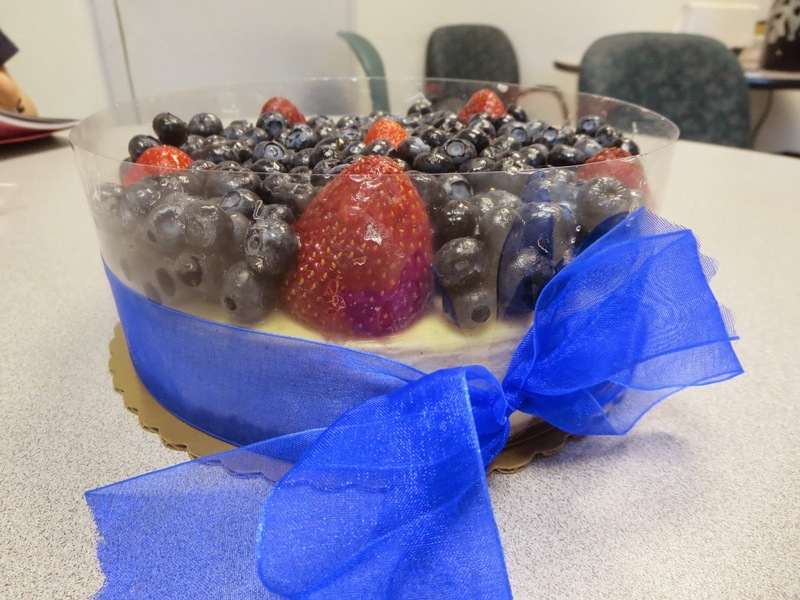 A graduate student who has been enjoying his afternoon treats stepped up to the plate and brought us something. The easily recognized Whole Foods Pastry Box! Nicely presented with a bow! 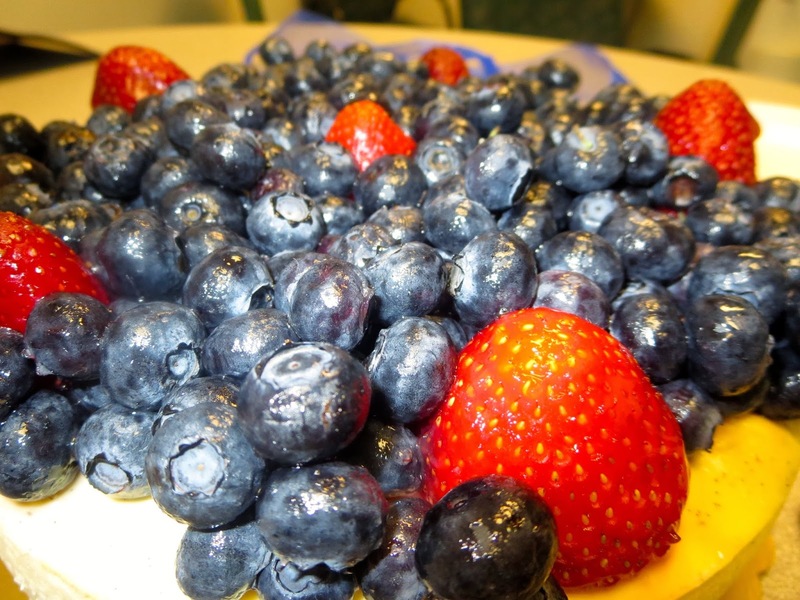 Fresh blueberries instead of the pie filling! Happy with his first cake hour contribution! 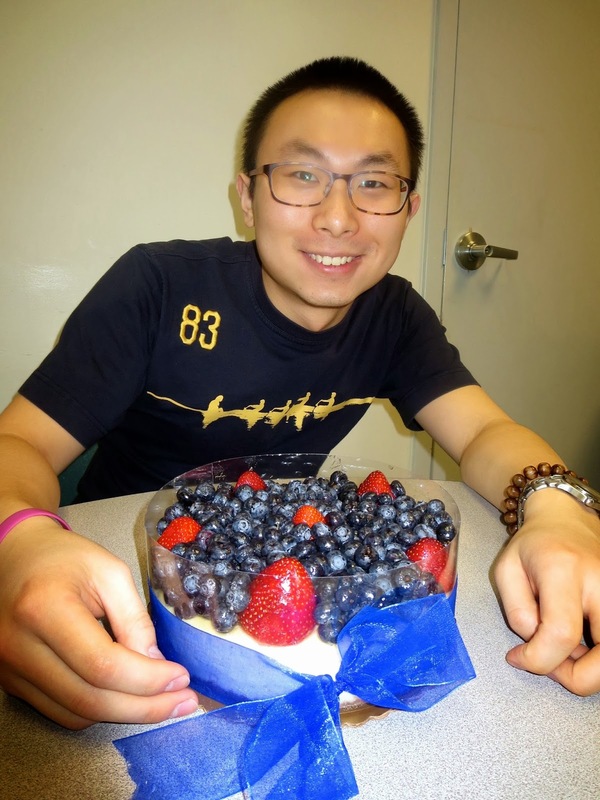 He opted for a cheesecake with blueberries from Whole Foods. This was, as usual, a nice looking creation. We always like the way that Whole Foods uses the plastic and the ribbon to wrap the cake and make it look like a gift. We think in this case it might also have been to hold in the blueberries. 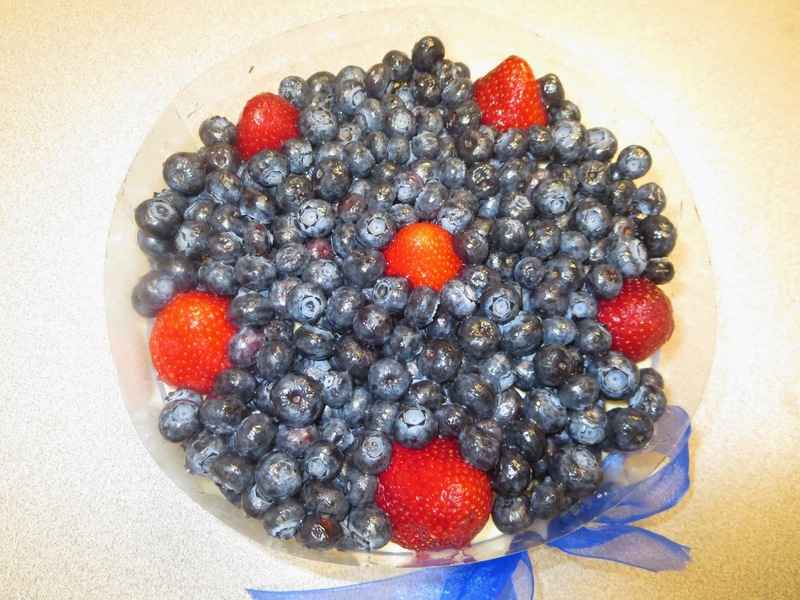 Most of the time fruit on top of a cheesecake is bound together with unflavored gelatin or another similar thing or they use a cooked blueberry topping like in a pie. Not this cake. Those blueberries were just dumped on the top. It made for interesting slicing! Those berries are ready to roll! This was very well received. Whole Foods does a good job and this was no exception. 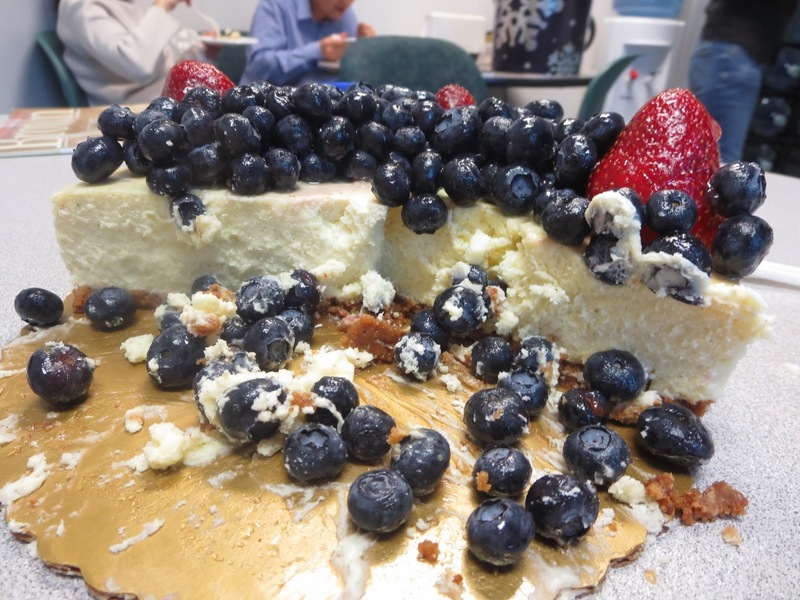 There was plenty of fruit to go around and the cake quickly disappeared. Another one doesn't last long! 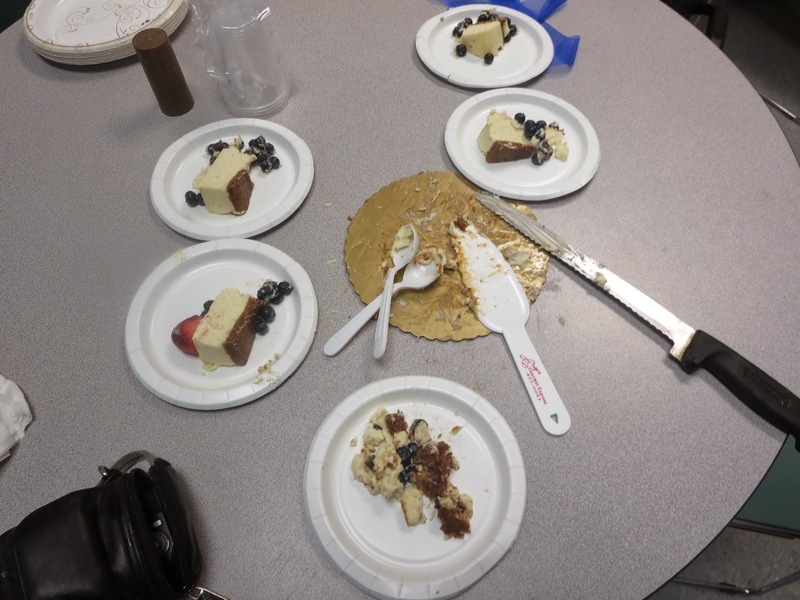 It was supposed to be a flan! Ah the unexpecting! 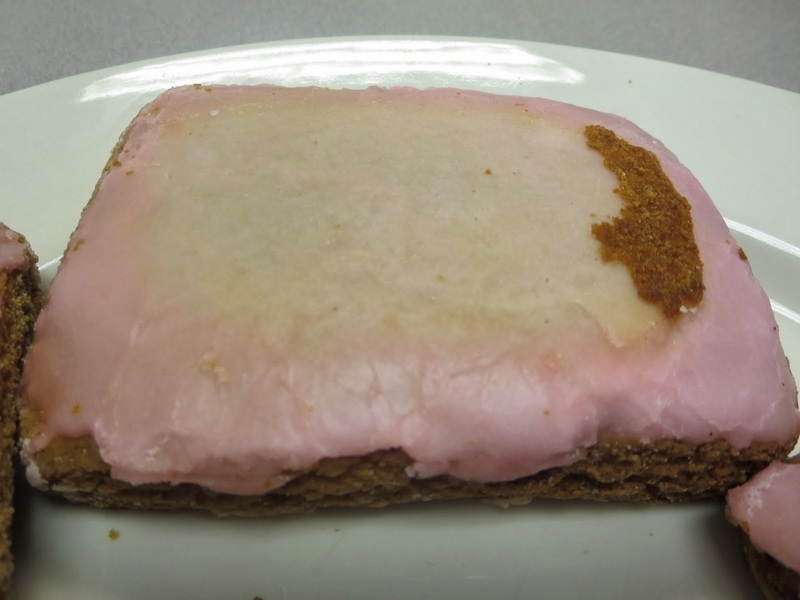 We have a colleague who has started doing some work here and has been sort of around at cake hour. She was here last week and so I very nonchalantly asked if she was going to be around this week. When she said of course she would, I responded with "Good, sing up for a cake!" ...and she did! 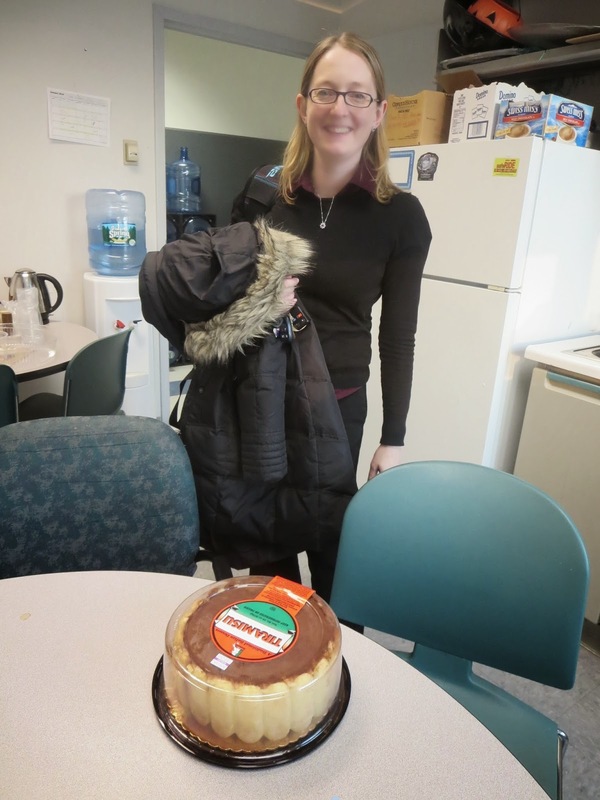 There was a brief discussion about flan and our newly designated cake bringer's mother supposedly made a good one so she would bring that! 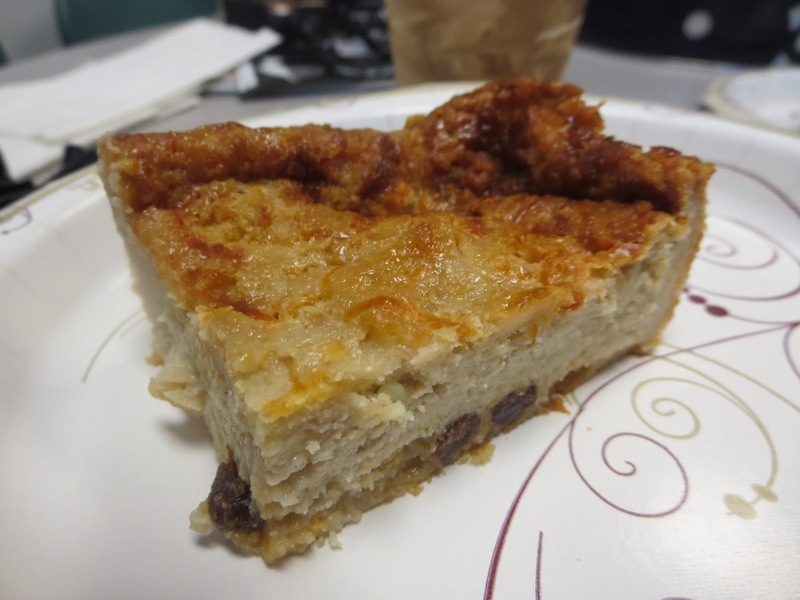 I said flan but it's bread pudding! 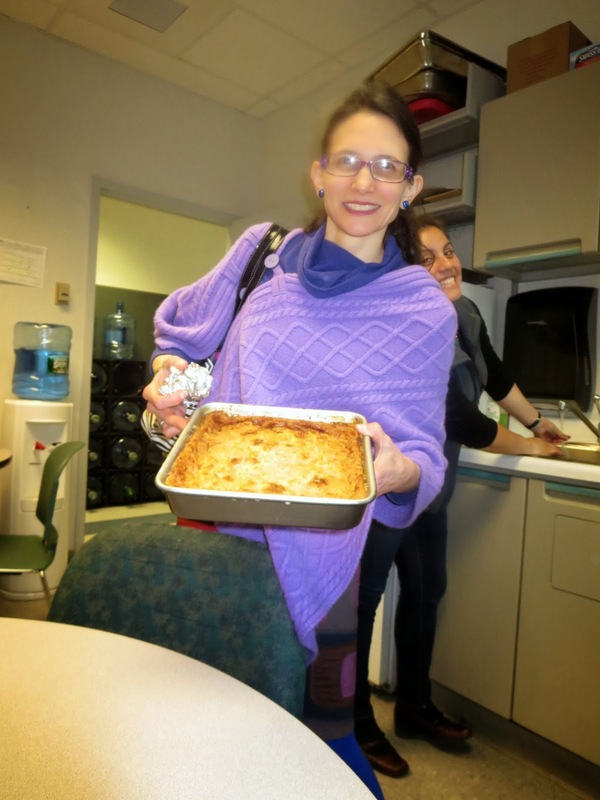 Although she got stuck in traffic and was a titch late she showed up with...a bread pudding. Not that this mattered to most of us but those that are gluten sensitive would have preferred the flan. The rest of us just dug into the bread pudding. 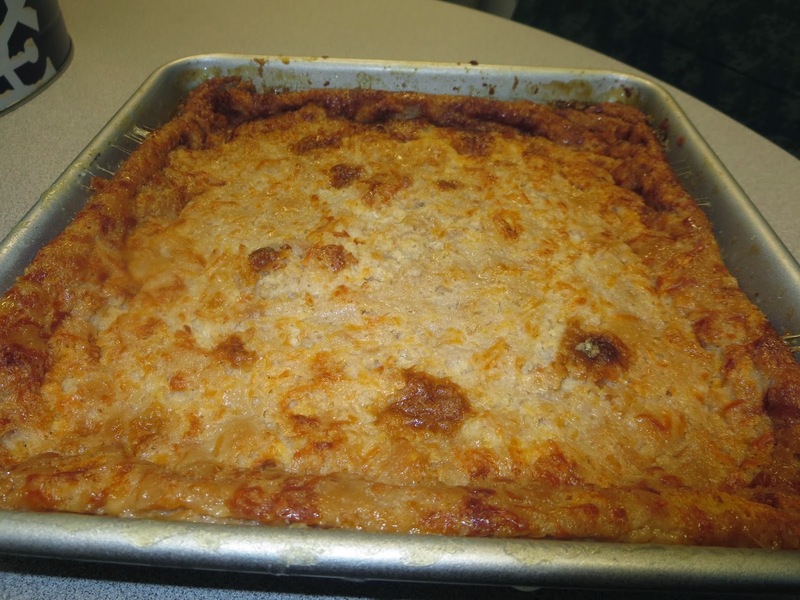 It looked very nice with a beautifully browned surface. Clearly Mom knew what she was doing. The pudding itself was smooth, not chunky like a lot of them. It was very moist but not that heavy or sweet. It was quite tasty by itself and didn't need any of the usual sauces that accompany bread pudding. That might not have been had but we did without. Slices good and smooth - not the chunky kind! 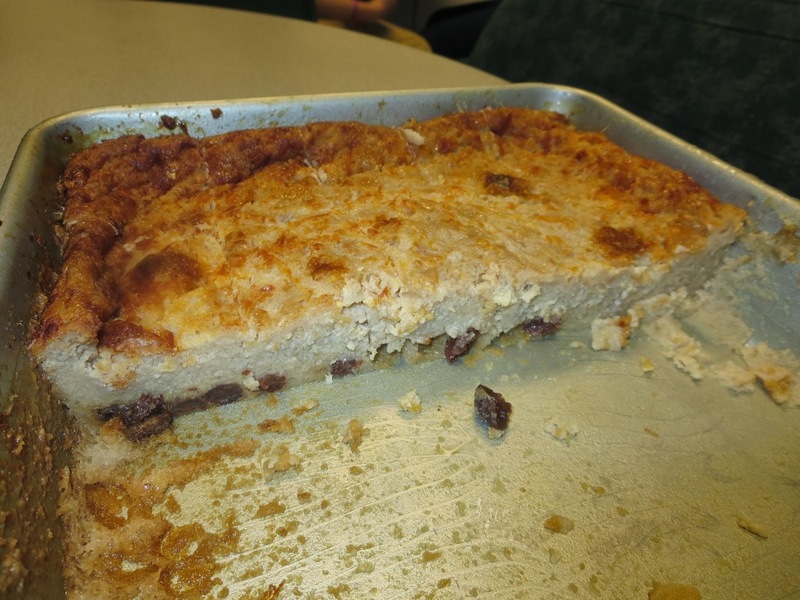 We were told that it had a bit of rum added to the batter and that the raisins which were on the bottom had been soaked in wine. Both of these added to the appeal for sure.Bottom line, this was very good and very well received. 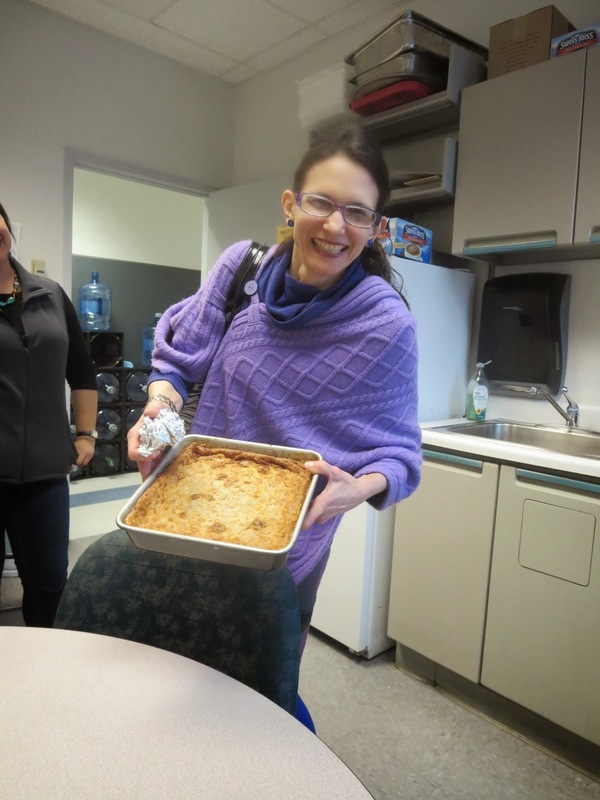 We look forward to the next time we trick, er - convince our colleague to contribute some of Mom's goodies. Them's wine soaked raisins on the bottom! 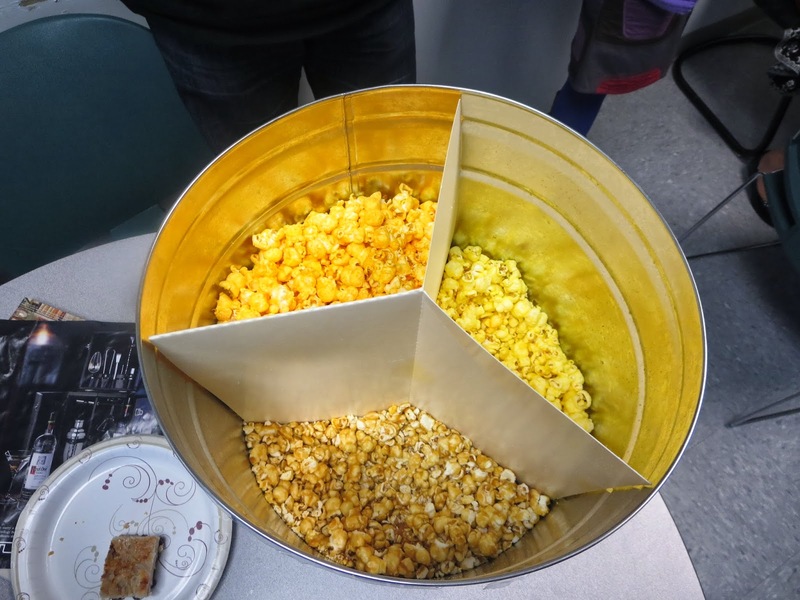 We are continuing to track the amount of time it is taking to finish off last week's tub of popcorn. The caramel corn is taking the lead. We are getting there. Bricks and shells and pushups! Our friend who introduced us to the Rosca de Reyes, had a few more things up her sleeve or in her luggage for that matter. Conchas and Ladrillos which translates to shells and bricks. 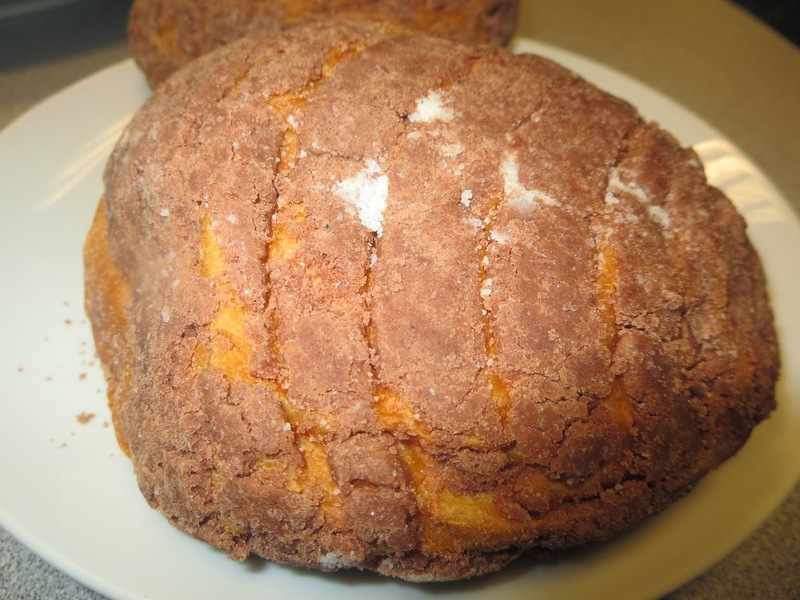 These are two more Spanish baked goods. 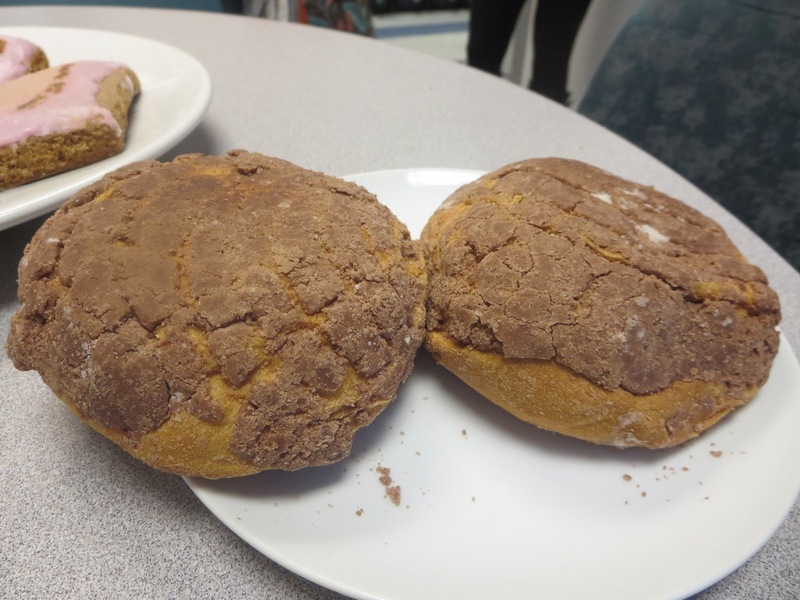 The conchas looked a bit like cinnamon rolls, the ladrillos looked like..bricks. 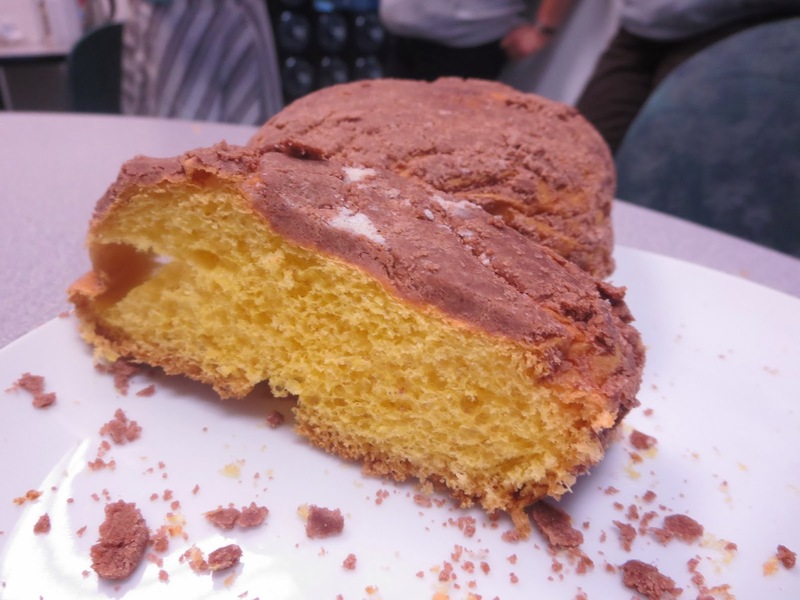 Our associate referred to the choncas as conchas de chocolate but we think they were conchas de canela or actually cinnamon shells as there wasn't much of a chocolate taste. Both of these treats are a little on the dry and not too sweet side. As we've said ad nauseum, that means they are good to have with coffee or tea. They were very much like a light bread with a sweet cinnamon sugar on top. The sugar was the only part that sated the sweet tooth. They conchas appear to have been well received. Look like a big cinnamon roll! Nowhere near as dense or sweet as a cinnamon roll! 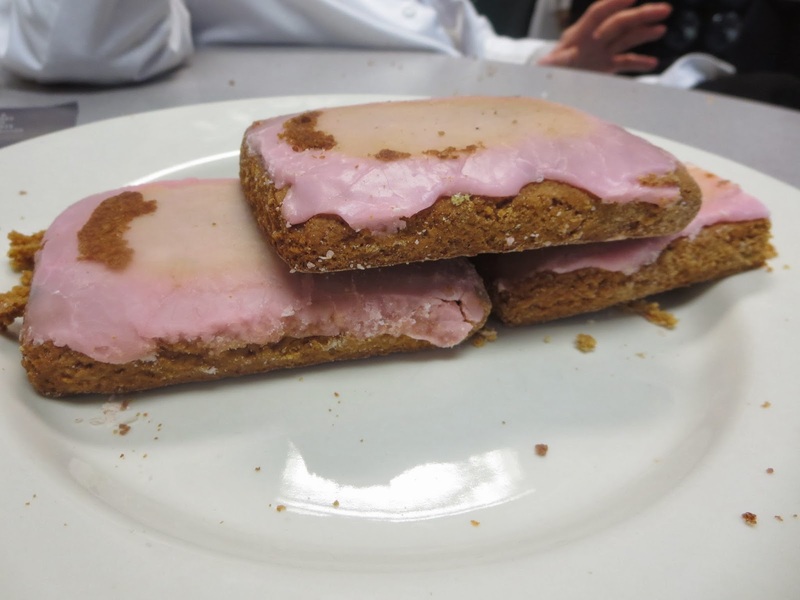 In contrast the bricks were denser pastry, also not very sweet, but covered with a sugar syrup type glaze that was flavored like strawberry. They were also very good. 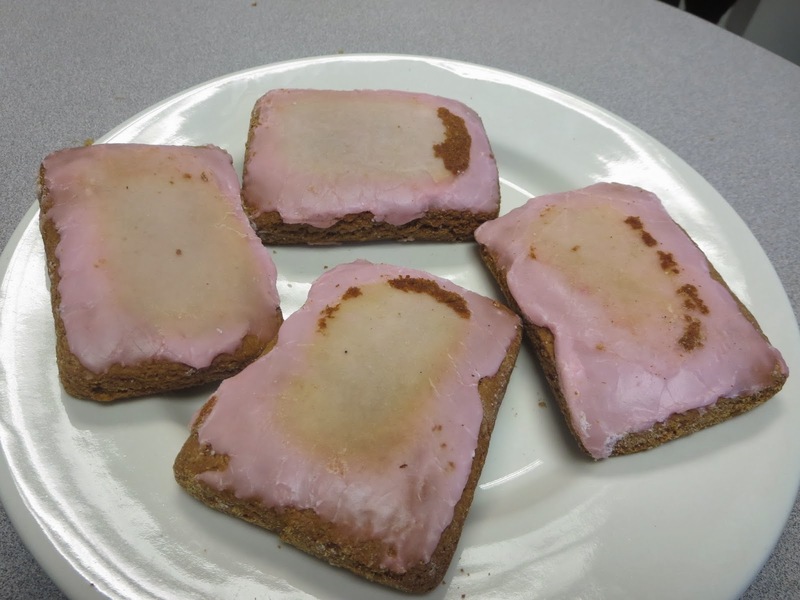 We have actually had these before but to many they were a new cake hour taste treat. It does look like a brick! It stacks like a brick! I can see a brick facade there.. The cake hour calendar was a little sparse for the month but with a little strong-arming we fixed that. Let's see if this goes anywhere! Day 2 for Popcorn and pizza??? 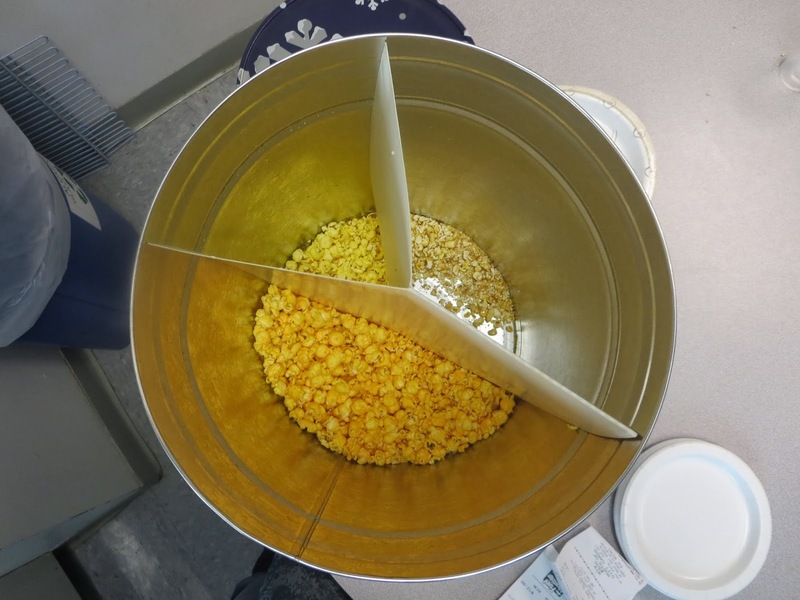 The Popcorn Factory provides a lot of corn..